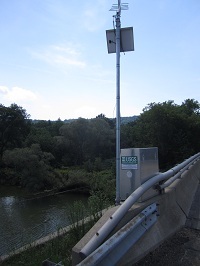 LOCATION.--Lat 41`45'38", long 76`40'30", Bradford County, Hydrologic Unit 02050106, located on left bank, downstream side of bridge on State Route 3019, 0.25 mi south of West Burlington, 13 mi upstream from mouth. PERIOD OF RECORD.--July 2010 to current year. GAGE.--Water-stage recorder and crest-stage gage. Datum of gage is 920 ft above National Geodetic Vertical Datum of 1929, from topographic map. Satellite telemetry at station. COOPERATION.--Station established and maintained by the US Geological Survey. Funding for the operation of this station is provided by Repsol Oil & Gas USA.